Successful opportunistic real estate investing has much to do with the relative trajectory of local metro economies that directly influences supply of and demand for residential and commercial property. You already know that Bow River’s real estate investment team is focusing extra attention on certain Rodeo Region cities: Phoenix, Dallas, Houston, and Las Vegas in particular. Among the economic-demographic fundamentals that we track to predict opportunity is domestic net migration within the US–where people are moving to and from. Net domestic in-migration tends to correlate with rising property demand and values; out-migration the opposite. In sum, we generally (with a few specific exceptions) target real estate in metro areas where housing is affordable, and good jobs are being created. It’s not a secret that Sunbelt cities, many within the Rodeo Region, have been the big winners in recent years. To better isolate geographic investment upside and risk, we have been unpacking US Census data (American Community Survey) on the largest net changes in resident population between various US counties/cities over a five-year period between 2012 and 2017. This analysis excludes international migration, or natural changes explained by birth/deaths. Below, we have arrayed the top five “Winners” and “Losers”. Between 2012-2017 Maricopa County, AZ (the core of the Phoenix metropolitan market) tops the list with 221,000 net population increase. Dallas comes in second, with two counties (Denton and Collin, both in the northern suburbs of the Dallas-Ft. Worth Metro area) heavily contributing. Clark County (Las Vegas) is #3—and so on. Interestingly, the only Top 5 Winner not in the Rodeo Region is Fort Myers/Cape Coral Florida, benefiting from a significant influx of people escaping the northeast US. 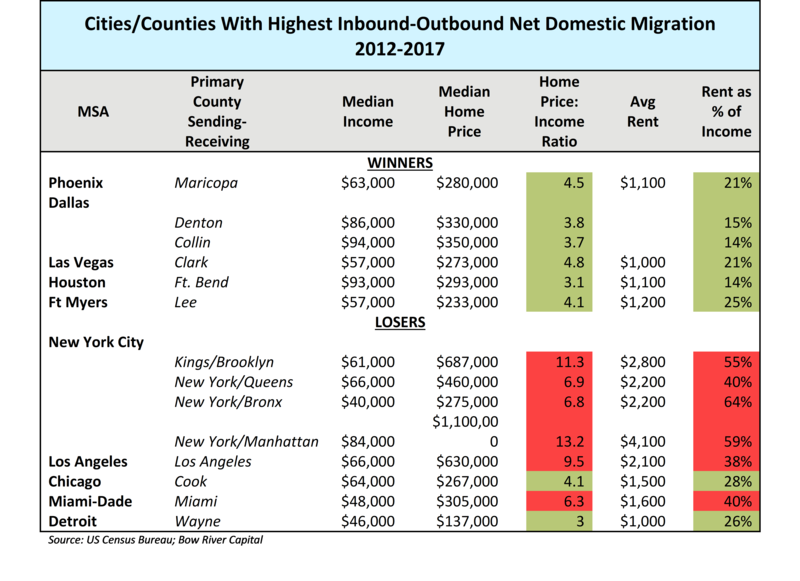 The Top 5 Loser list is not surprising: New York City (sending people from four counties in that MSA) with other large cities around the country where low incomes and a sharp rise in housing costs are prompting flight to more affordable destinations. Notable to this analysis is not just absolute numbers of population gain/loss, but also the relative proportion of each metro area’s population that that net migration represents. For example, New York lost 4% of its population; and the remaining four “Losers” lost 3% net over the five-year period. 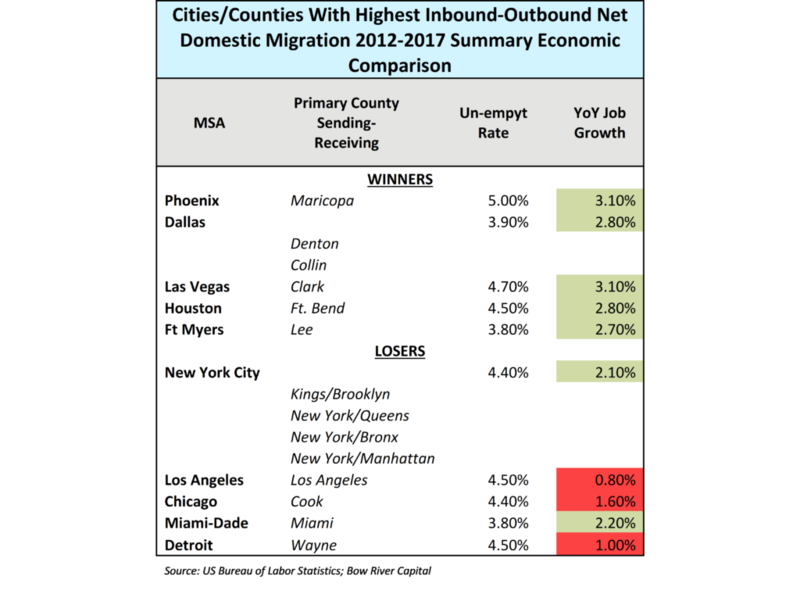 On the plus side Ft. Myers is the clear winner, with net in-migrants swelling that Florida area’s local base by a full 15% in a five-year interval. For Bow River the Ft. Myers statistic is interesting but will not lure our investment interest given the small size of this metro area. 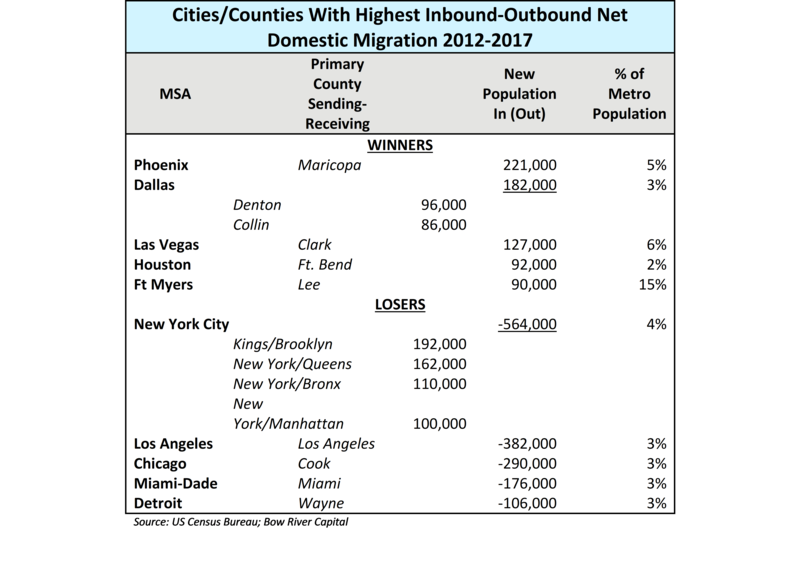 The other markets on the Winner roster are drawing our attention, especially Las Vegas (boosting its MSA population by 6%) and Phoenix (at 5%). Ergo our relative interest and activity in these two cities. Allow us to explain more fully. The US Census Bureau reminds us that the two primary reasons for population movements between US cities are Housing and Employment. According to the Bureau of Census (Population Estimates and Demographic Components) the principal reason (55%) referenced by relocating Americans is for housing-related reasons: move to a new or better home, to find more affordable housing, or to own a home instead of rent. Most US cities that lost population demonstrate high levels of housing unaffordability. As of 2017, rents ranged between 14% to 25% of the median income in the top five places 10 where people are moving, while it ranges from 26% to 64% of income in losing metros. Rents tend to be significantly higher in losing cities, with incomes not sufficiently higher to offset this expense. We have assigned green and red colors to illustrate relative affordable/unaffordable statistics above. With respect to housing affordability relative to local income, the average price of a house in the top five metros is higher as well. Detroit is an exception on housing cost. It is worth noting that Bow River has made some strategic investments in Detroit, given specific opportunities in properties/micro markets there which outweighed the macro of this analysis. Look at Phoenix versus Los Angeles, where many Phoenix in-migrants come from: the median annual household income in the Arizona city was around $63,000 in 2017, only about $3,000 less than that in Los Angeles metro. But rents were $1,000 per month cheaper in Phoenix and the median price of a home is $350,000 less in Phoenix versus LA. When someone says they’ve moved for housing reasons we understand other factors are working too. Climate, low occurrence of natural disasters, amenities, cost of living…everything from food to transport to taxes are contributors. Bow River likes the fact that Arizona and Nevada (and Texas) also offer runway on future housing affordability. The regulatory environment in these states is more accommodative than elsewhere, supporting relatively quick and less costly new development. Yes, these factors can also lead to excess supply volatility in those places, so Bow River is intent on catching things early in an up-cycle to minimize this risk. Future growth is also enabled by relatively new and robust transportation infrastructures and good domestic water supplies. Bow River continues to focus on net migration to inform our thinking about where to invest next. While the data above is now a year old, we have no reason to believe that the 2012-17 trends are not continuing today. People follow money. The Census Bureau cites “job availability” as the second most important reason for population movement (18% of migrators seek employment, or a better job). It’s not enough to have cheaper homes if you won’t have a job and income to support a mortgage or rent payment. The 2017 jobs-related data in Phoenix and Las Vegas, and other Winner metros below, demonstrate this correlation. Looking at more recent employment gains data (Bureau of Labor Statistics; January 2019) by metro area underscores Bow River’s interest in Phoenix and Las Vegas. Among “large” American metro areas (there are 38 Metropolitan Statistical Areas/MSAs in the US with populations above 2 million), the most recent data ranks Phoenix #3 and Las Vegas #4 in 12-month percentage employment growth among large cities—the single most crucial indicator of go-forward metro economic health in Bow River’s eyes. Again, Bow River has used green and red markers to point out job growth strength and weakness in the last 12 months. Let’s look more closely at last year’s job growth in Las Vegas. How do the various cohorts/types of jobs created compare among America’s 38 large metro areas? #8 Transportation and Warehousing (1,200 new jobs between new-expanding operations at Caremark, Sephora and Fortress Innovations). This logistics sector is an important signal to Bow River as we continue to invest in new industrial product there. We know what you’re thinking. What about gaming? The Leisure and Hospitality sector in Las Vegas is indeed growing but ranks a middling #21 among large US cities. Las Vegas growth is now far beyond its gambling roots. In sum, all the above has helped Bow River focus on Phoenix and Las Vegas. Of course this kind of macro research is designed only as a first cut as we weigh geographic options. We still must find good risk-adjusted opportunities within these markets, with many deals examined and only a few that pass our thorough underwriting. We have invested in several, and we are looking for more, in these two cities. We are also searching Texas targets (as you know we have a portfolio assets in San Antonio, Dallas and San Marcos; in addition, are busy evaluating other opportunities in the state). For the time, however, don’t expect us to go to Ft. Myers.